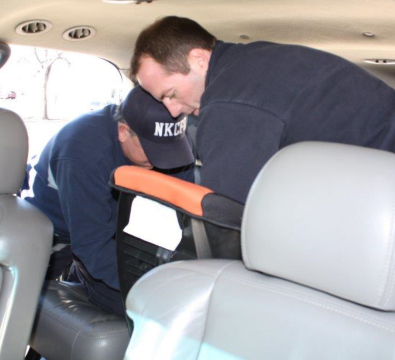 The Mid-America Regional Council (MARC) has received a federal grant to provide car seats to low income families and has partnered with the North Kansas City Fire Department to be its car seat installation facility. Our Fire Department is the largest car seat installation facility in the Metro area. We have installed hundreds of car seats since the beginning of the program and we have 20 certified car seat technicians that will install and/or check your car seat. This program has income restrictions. To find out if you qualify for a car seat please call us at (816) 274-6025. Appointments are necessary and our installation times are Monday – Friday from 3:00 pm. to 4:30 pm. Car seat installations usually take fifteen to twenty minutes.